If you wanted to be lawyer in Sri Lanka you have to study at only one State professional institute of Sri Lanka Law College. This will applicable for those who following Law Degree Programme in Private Universities or Open Universities. Where all the students should face Sri Lanka law College Examinations to obtain their attorney at law status. Therefore Sri Lanka Law College Entrance Examination is highly competitive examinations held in Sri Lanka Professional Steam. application closing date will be 31st March 2017 and Law Entrance Examination will be held on September 2017 and enrolment starts on January 2018. Application forms for admission of students for the Academic Year 2018 will be available from 01st March, 2017 to 31st March, 2017 in the Sri Lanka Law College Office on any working day between 9.00 a.m. and 12.00 noon and 1.30 p.m. to 3.00 p.m. Applicants should have completed seventeenth year of age at the date on which submission of Applications close. All applicants are required to sit an Entrance Examination to be held only in Colombo in September 2017. Duly filled application with photocopies of educational certificates should be forwarded to The Principal, Sri Lanka Law College, 244, Hulftsdorp Street, Colombo 12, not later than 31st March, 2017 under registered post. The Brochure containing relevant information, the application form and model question papers is available at a price of Rs. 4000/-. The payment for the above could be made at any branch of the Hatton National Bank to the credit of A/C No. 063010004875, Hatton National Bank, Hulftsdorp Bianch, or Bank of Ceylon to the credit of A/C No. 0001369779, Bank of Ceylon Hulftsdorp Branch. 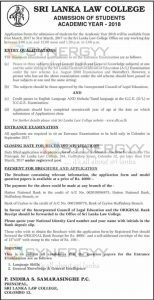 In favour of the Incorporated Council of Legal Education and the ORIGINAL Bank Receipt should be forwarded to the Office of Sri Lanka Law College. Please quote your National Identity Card number and your name with initials in the Bank deposit slip. Those who wish to obtain the Brochure with the application form by Registered Post should forward the ORIGINAL Bank Receipt for Rs. 4000/- and a self-addressed envelope of the size of 15″x10″ with stamp to the value of R.s. 150/-.